A healthy diet and good nutrition go hand in hand. Taking the recommended amount of nutrients on daily basis, play a vital role in balancing nutrition equation and preventive care. Riboflavin also known as B2 is involved in energy metabolism and protects our body against migraine and cancer. Being a water-soluble vitamin, it is quickly excreted out of your body. So in order to replenish the levels, you need to incorporate riboflavin-rich food into your diet. Just make some strategic swaps in diet and you can get enough riboflavin to ward off chronic diseases. Vitamin B2 helps in the fighting of migraine headaches. Interestingly enough, in migraines, doctors usually prescribe high doses (400mg) of riboflavin to combat symptoms. Vitamin B2 deficiency leads to a chronic headache. Just like vitamin A, riboflavin is also known for improving eye health and longevity. It minimizes the risk of eye-related diseases like keratoconus, cataract, and glaucoma. B2 is part of eye drops used in treating glaucoma. It enhances the endurance and strength of eye and protects the cornea. B2 is involved in the production of RBCs and steroids. Red blood cells are involved in transportation and supply of oxygen to body cells. 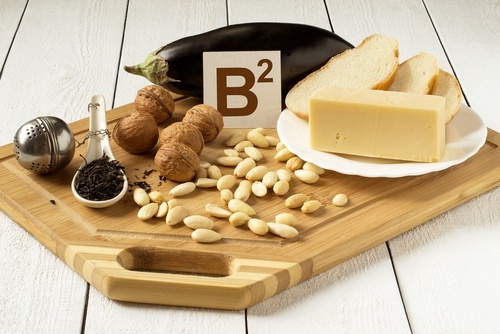 B2 deficiency can lead to anaemia and sickle cell anaemia. Not only this, B2 decreases the levels of homocysteine present in blood which is a harmful by-product of protein metabolism. Riboflavin-rich diet can protect your body from anaemia. Riboflavin plays a tremendously important role in the production of collagen. It is a primary protein involved in maintenance, growth, and development of hair and skin. 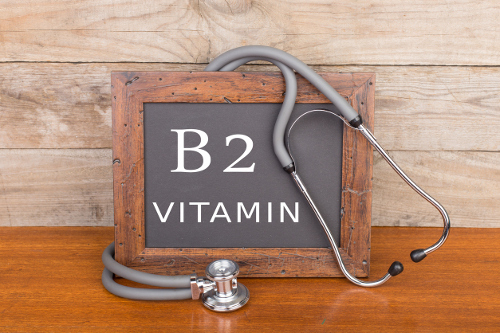 Deficiency of B2 will result in less collagen production, resulting in acne and wrinkle-prone skin, liver spots and rough skin. Collagen deprived skin is more vulnerable to aging signs. The RDA for adults is 1.3mg for men and 1.1 mg for women.